I read book about Steve Jobs and Apple written by Leander Kahney. Book's name was Inside Steve's brain. Copy I had was an extended edition of this book. I figured out from the name, that the book would really dig into mindset of Steve Jobs. I knew that writer Leander Kahney didn't have the permission from Steve Jobs for this book, but still I assumed he had second hand material which would open up the mind of one interesting technology leader. I have to start with the negative side of the book. 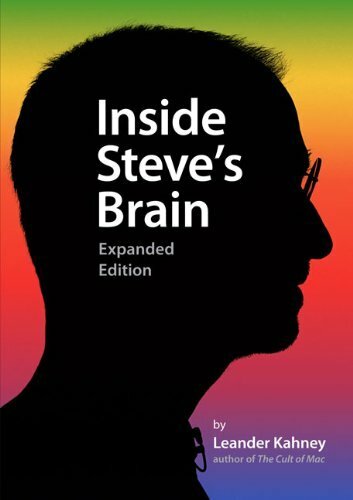 It promises in the name that it would be "inside Steve's brain" and would really tell why Steve Jobs behaves as he does, what are his motives and driving forces. Unfortunately this is not what the book really is about. Book really is an entertaining and excellent one, but it doesn't really fulfill it's promise from the name. I expected it to be different than it was, but when I got over the disappointment, I realised there's lot of good in this book. If you admire Apple products, like most of us do, this is the book that tells more about how Apple creates it's products. It tells about excellent people and their processes to create these innovative and cool looking products of theirs. It could almost work as a bible for those who believe that Apple's way of building products is the best and only way. It really gives lot of food for thought about importance of design, product thinking, innovation and clear focus, when creating products. I specially loved the parts where it told how innovations and designs are created at Apple. Innovation and beautiful designs don't just come from great thinkers, but they need hard work and lots of iterations even from some of the best guys in the planet. For guys creating any types of products, you should be aware how Apple has done theirs. Understanding that methodology will give you good ideas how to improve your own organisation on improving the ways you create products. That's the reasoning I would sell this book to you if not an Apple fanboy. If you are, then I guess I don't need to sell it to you. I have to admit I was hoping the book to be more about Steve Jobs. This book was mainly about Apple, which for some might equal to Steve Jobs, but not for me. I've found Mr. Jobs personality and experience such an interesting, that I hope to find more about that on the soon to come book Steve Jobs.